Promoter Ged Rathbone has dropped a hint that he could be prepared to rip up his mis-firing Panthers team ahead of the sport’s signing deadline. Fans have called for changes in the wake of a 59-34 drubbing at Newcastle last Sunday night which left the city outfit looking over their shoulders in the race to secure a Premier League play-off spot. Rathbone is quick to admit he understands the frustrations of supporters ahead of a run of four successive home meetings in the next 10 days which are likely to make or break the 2016 campaign. There will certainly be no changes in personnel ahead of the first of those fixtures - a return clash against play-off rivals Newcastle tomorrow night (Friday, 7.30pm) at the East of England Showground. That is followed by a Bank Holiday Monday visit from struggling Redcar (7pm) ahead of a September 4 double-header which features clashes against Rye House and Workington. Their other remaining fixture in the regular season - a recently postponed away trip to Edinburgh - is still to be rescheduled. Rathbone said: “I totally understand where the fans are coming from and we are well aware that certain riders have not been producing what we expect of them. “I’m certainly not ruling out making changes, but I definitely will not be rushing into them. “We could make anything from one to four changes to the team before the deadline if we decide that is the way forward. “I have never let the supporters down since taking the club on in the winter of 2014, and I won’t let them down now. “But they have to trust myself and my management team to make the right moves at the right time. One potential target that Panthers have been forced to rule out of their plans is Nicolai Klindt. The Danish rider, who had a brief spell with the club in their final Elite League campaign in 2013, is available on a bargain 5.42 average. Klindt was said to be keen on a move, but Rathbone revealed it is a no-go due to his top-flight side, Leicester, already having the maximum two permitted doubling-up riders in addition to their Elite Draft Riders. Rathbone added: “Nicolai made it clear that he was extremely keen to join us and he was devastated when I informed him it wasn’t possible. 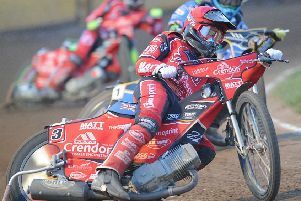 “Unfortunately Leicester already have Ludvig Lindgren and Aaron Summers doubling-up in the Premier League, and the rules don’t permit a third rider to do it.